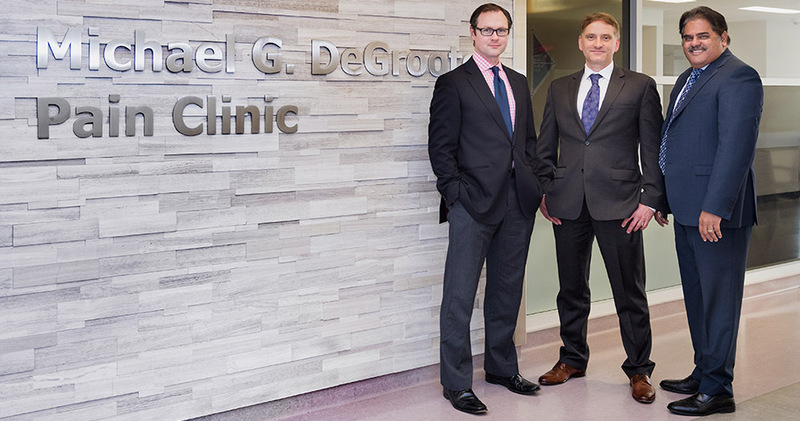 Michael G. DeGroote Centre for Medicinal Cannabis Research co-directors James MacKillop and Jason Busse and medical advisor Dr. Ramesh Zacharias. Medicinal cannabis has been legal in Canada since 2001, but there is still little research proving its effectiveness. A new research centre has been launched by McMaster University and St. Joseph’s Healthcare Hamilton to address the issue. The multidisciplinary Michael G. DeGroote Centre for Medicinal Cannabis Research (CMCR) will focus on conducting research, sharing evidence-based information and creating a network of professionals interested in further understanding medicinal cannabis. Leading this initiative are co-directors James MacKillop and Jason Busse and medical advisor, Dr. Ramesh Zacharias. MacKillop is a professor of psychiatry and neurosciences at McMaster’s Michael G. DeGroote School of Medicine, and director of the Peter Boris Centre for Addictions Research at St. Joseph’s Healthcare Hamilton. Busse is an associate professor of anesthesia for McMaster’s medical school and a researcher for the Michael G. DeGroote National Pain Centre. Zacharias is a pain specialist, medical director of the Michael G. DeGroote Pain Clinic at Hamilton Health Sciences and assistant chief coroner for Ontario. The leadership team, working with more than 25 researchers, seeks to understand the use of medicinal cannabis in managing pain, and other clinical indications, as well as its potential for addiction and other adverse events. Research projects include reviews of the economic and policy implications of cannabis legislation and the development of methods to measure chemical ingredients in medicinal cannabis products. The creation of a community dedicated to generating the clinical evidence required for informed medicinal cannabis use now and in the future is critical, said Zacharias. “At McMaster, we have a commitment to discovery and innovation and the issues critical to our community, and this new centre will be delving into important concerns regarding the health care of Canadians,” said Paul O’Byrne, dean and vice-president, Faculty of Health Sciences at McMaster. St. Joseph’s Healthcare Hamilton provides regional services, serving nearly 24,000 patients annually in its mental health and addictions program. The centre is hosting its first conference on the science of cannabis, with local, national and international experts in the field on Feb. 9 and 10, 2018 in Hamilton. More information may be found at cannabisresearch.mcmaster.ca/conference. The website for the Michael G. DeGroote Centre for Medicinal Cannabis Research is at cannabisresearch.mcmaster.ca.